Special Report: Should Filipinos worry about the economy? IN THE United States in 1991, a famous quote about the economy by a campaign strategist turned voters against the other party. In the Philippines today, government critics have raised concerns over the economy amid the government’s fight against corruption, illegal drugs and loiterers. The indicators do not look good. Among others, inflation reached a five-year high in June, the peso is trading at a 12-year low against the US dollar, interest rates are higher, the stock market is in bear territory, gross international reserves are dwindling, and foreign investment is low. Is there cause for worry? 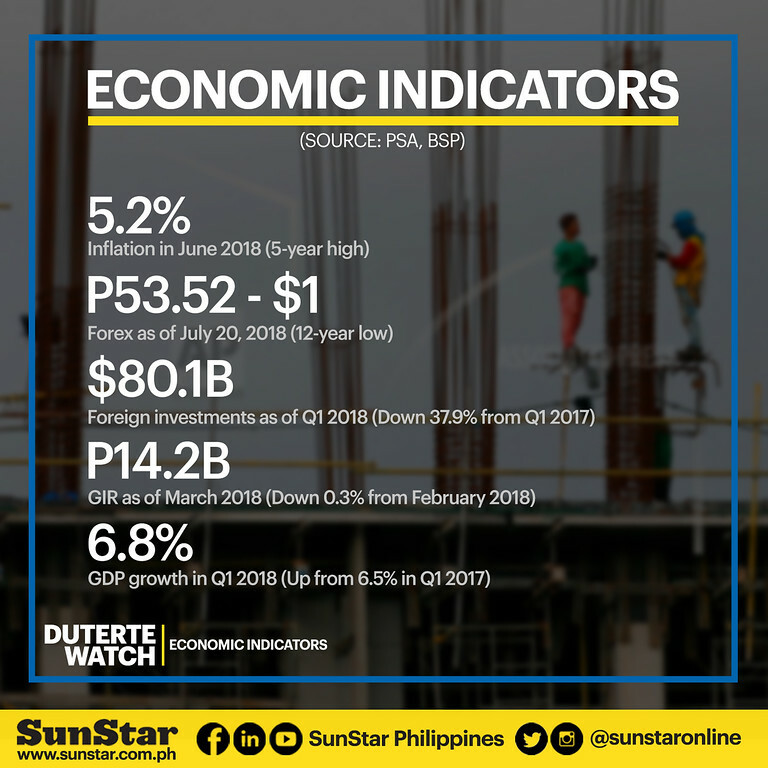 Gross domestic product (GDP) grew 6.8 percent in the first quarter of 2018, making the Philippines one of the best performing economies in Asia next to Vietnam’s 7.4 percent growth, same as China, and higher than Indonesia’s 5.1 percent. “We need to remember, however, that apart from changes in the internal or domestic environment (for example, the Tax Reform for Acceleration and Inclusion or Train law), changes in the external environment have contributed to the current domestic economic situation,” Terosa, dean of the University of Asia and the Pacific (UA&P) School of Economics, said in a separate email. “Hence, some of the internal economic woes being faced by the country can be reduced if the external environment will be less volatile. Also, the internal economic issues faced by the Philippines cannot be traced to domestic issues alone. These issues have been forced upon the domestic economy by external events as well,” Terosa added. Among the external pressures he cited are the volatile petroleum prices and trade issues among developed countries. One of Cebu’s business leaders, Sabino Dapat, expressed concern over the rising inflation, which reached a five-year high of 5.2 percent in June amid the implementation of the Train law. “Don't bother yourself about our stock market, it is too small to really matter and immediately affected by the events in the international investment market. Pulling out of the dirty money in our equity market is similar to shockwaves that does not affect much the lives of the masses,” he said. “But inflation does (affect the masses) because it is some kind of taxation. It erodes the earnings of the masses,” he added. “That the masses must understand,” he said. Today’s woes, however, do not mean that the economy is worse off under the current administration. 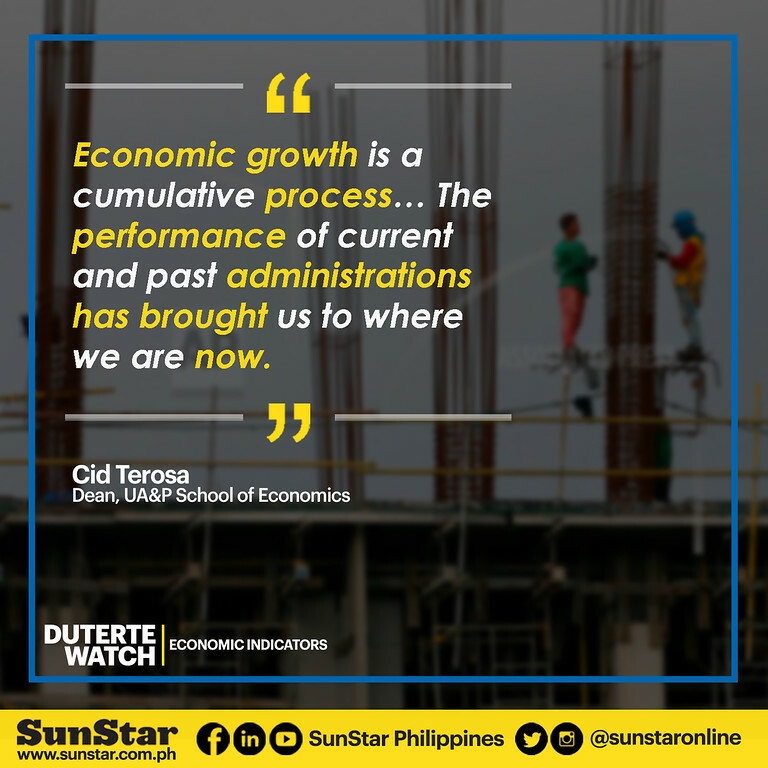 “The evolution of the economic performance of the country cannot be attributed to one administration alone,” Terosa said. “We need to remember that economic growth is a cumulative process. Economic growth or economic decline can be compounded through time... The performance of current and past administrations has brought us to where we are now,” he added. “This is something that past administrations have not done on a bigger and bolder scale,” Terosa said. Government has revised its key economic assumptions as a result of the discouraging economic figures as of June 2018. During its July 2, 2018 meeting, the Development Budget Coordination Committee (DBCC) raised inflation and interest rate projections, among others. Inflation forecast has been brought up to 4-4.5 percent for 2018 from 2-4 percent. As of June, inflation reached a five-year high of 5.2 percent. The Bangko Sentral ng Pilipinas earlier said inflation will peak in the third quarter before tapering off towards the end of year and converging to the 2-4 percent target for 2019 to 2020. Pernia said inflation is projected to go down to 3.2 percent in 2019. The government is also sticking with its gross domestic product (GDP) growth target of 7.0 to 8.0 percent for the year. Both Pernia and Terosa agreed that the economy is not overheating as some government critics warned. “(Overheating) still remote. Average capacity utilization is at 85 percent, so there’s enough headroom yet,” Pernia said, apparently referring to the country’s production capacity. Terosa is of the same mind. “No, the economy is not overheating. Industries still have unused production capacity and inflation is not uncontrollable at this stage,” he said. The Philippine economy, however, will continue to be challenged by external events for the rest of the year. 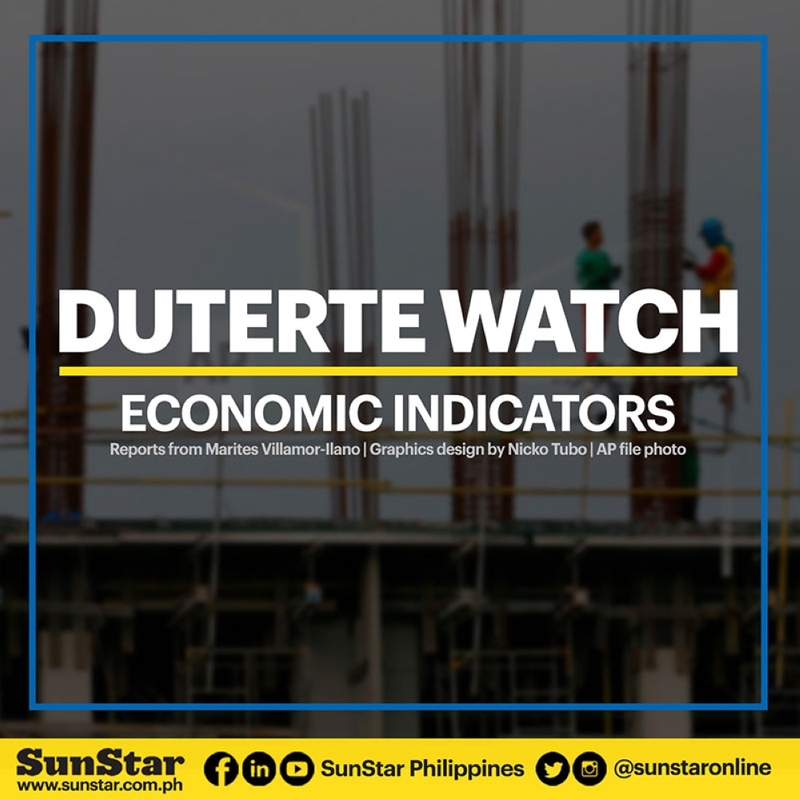 “Next year, the Philippine economy might perform better depending on how it can cope with inflationary and external pressures this year,” he added. 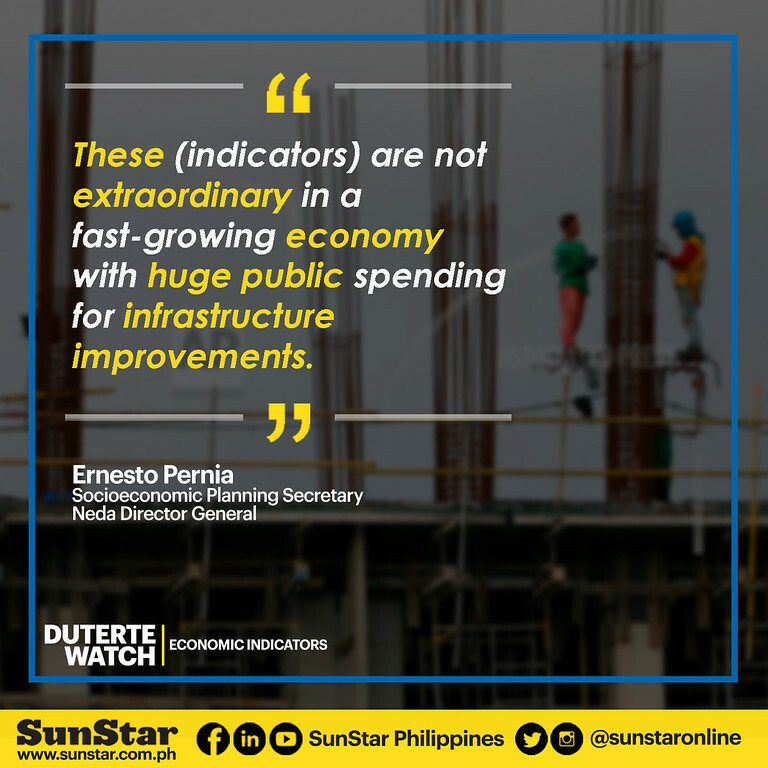 Pernia, for his part, noted that there will be several game-changing infrastructure projects that will break ground under the government’s Build Build Build program. He also cited more policy reforms, such as rice tarrification, ease of doing business, and lifting of foreign investment participation in a number of areas. Dapat, like others in the business community, has adopted a wait-and-see attitude. He likened the Build Build Build program and the Train law to an earthquake experience. “We have to wait for the earth below us to settle down before we can start speculating about what the overall effect will be on the upper ground. We still have a long way to go before we can really feel and see the full effect of the changes made in our way of life from these developmental policies,” he said. He was worried, meanwhile, about the move to shift to a federal form of government. “When you allow politicians ‘to tinker’ with the Basic Law of the Land, we can only worry (about) what will happen next... With the kind of voters that we have in this country, any change in the Constitution has more than 50 percent chance of being passed in the referendum that will follow,” he said. “I am afraid that this will be similar to how Marcos changed the Constitution during the martial law years,” he added. But most Filipinos will probably not even bat an eyelash.